Keith Kaucher’s design career started professionally in 1994 getting his first custom car design a ’69 ZR-1 powered Camaro concept published in Car Craft magazine, but in reality Keith career really started a long time before that. If anyone was destined to have a career in the car industry, it was Keith. Born in Santa Monica, CA in October 1960 to Martin, and Elizabeth Kaucher, He could literally name every car on the road by the time he was three, when he was five his father Martin an aircraft engineer started teaching him how to draw cars. Though he learned his drawing skills from his father it was his mother Elizabeth that he inhere rated his strong sense of balance and flow in design. Keith was nine when he started building scale models of his favorite street cars, and at 15 he began putting his design skills together with his model building skills creating one off custom cars. Another big influence on Keith was his Uncle Alec also an avid car enthusiast he had several hot Chevys when Keith was growing up. One of those Chevys was a 1966 SS 396 Chevelle. It was silver with a painted black roof from the factory and his Uncle had modified the car with a set of 15 x 8.5 American Torq-Thrusts. Keith just loved that car and remembers that car being a part of a life defining moment for him. It was in the Summer of 1971 Keith was 10 years old, his Uncle Al, Uncle Jerry, his cousin Geno and himself went to a Mama Papa burger aka A&W in Selma CA. one afternoon. He said his Uncles were in there early twenties at that time and popular with the girls locally so soon as they pulled in, these beautiful young women came up to the car a couple got into the back seat with Keith and his cousin Geno. The girls played up to the two youngsters in the back seat rubbing their heads and hugging them. The song In a Gadda Da Vida was playing on his Uncle’s 8 track player. Keith realized at that moment that this was going to be his life. He had no idea that it would be in the design field at that time, but he knew he was hooked on the lifestyle. That car and that moment was such a big deal to Keith that he still has a picture of his Uncle Al and the SS396 Chevelle hanging over his design table to this day and his favorite custom wheel is still the American Torq- Thrust. It was about six years later that knew he wanted to be involved with car design. He started writing letters to General Motors asking about how to become a car designer and submitted work to them, they were impressed but surprised when they found out that Keith was only 16, but wrote him back with letters of encouragement. Keith’s fascination didn’t stop at car design, at 14 he began working with his next door neighbor Frank on a ’62 Corvette that he owned since 1963. Keith honed his mechanical skills and became fascinated with engines and how to build them up for racing. He double majored in Santa Monica High School in Art and Auto Mechanics. After graduation he worked as a mechanic in Speed Shops and in various other automotive related jobs, while he attended Santa Monica City College. He then went on to California State University of California where he graduated with a BA in Industrial Design. In 1995 Keith was hired by Superior Industries to design OEM and Aftermarket wheels, while he worked there full time he continued designing customs for clients on the side. In 1999 he left to pursue a freelance career, it was about then that his career shifted into high gear. Since then Keith’s work has graced the pages of Rod & Custom, Hot Rod, Truckin’ Classic Truck, Mustangs & Fords, Mustangs Illustrated, Popular Hot Rodding, Kit Car,and Hot VW magazines, not only contributing artwork, but writing the accompanying articles as well. 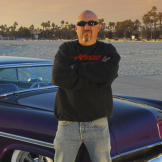 Keith’s success designing custom wheels for the aftermarket wheel industry fueled Kaucher Kustoms’ drive into the custom car market. Keith was producing several custom car designs a year when his brother Mitchell joined the team in 2005. Mitch, formerly a practicing attorney, partnered with Keith as Kaucher Kustoms began to grow. Mitch has proven to be a great addition and a fast read since he joined the team. Mitch now manages the business, sells their services, negotiates and writes contracts and sets up all show venues for the company. In 2006 Keith and Mitch showed up with a customized 1954 Ford Victoria at the Grand National Roadster Show and left with a first place for Best Post War Hardtop Traditional Custom. The slick looking Ford went on to be featured in several magazines, collected 17 1st place trophies out 19 California custom car shows entered, including Blackie’s Fresno Autorama and was a feature car at the 2006 SEMA show in Las Vegas Nevada. Since then Kaucher Kustoms has designed more than thirty custom cars ranging from ’36 De Soto Airflow to a ‘09 Camaro. In April of 2009 Kaucher Kustoms was asked by the Good Guys organization to design the 2010 Grand prize Give Away car. Keith designed a ’70 Mustang he named the Boss Snake, part Shelby part Boss 429 this car now completed is a real eye turner. There are still about 15 cars still under construction now and we should begin to see them hitting the car show circuit by mid 2010. So keep your eyes peeled at shows for cars with design by Keith Kaucher of Kaucher Kustoms on the sign board.